As someone who spends much of his working life dealing with the memories and concerns of those affected by Piper Alpha, Rev Craig believes that, while many families may be ready to move on, many offshore still want to mark the event, especially those who were too young to remember it. “For those who were working at the time of Piper it’s still a big, big issue,” he said. “People remember where they were and what they were doing. 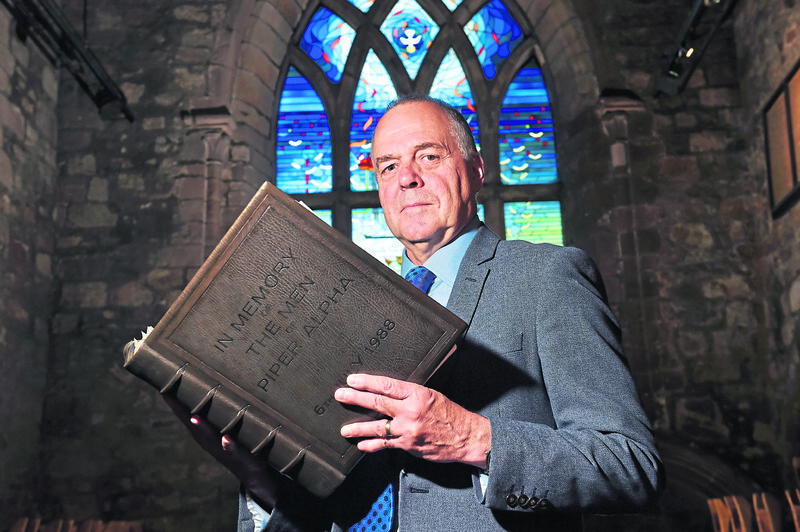 Offshore chaplain since 2012, one of the first major events Rev Craig was involved in was the 25th anniversary of the Piper Alpha disaster in 2013. Now with three decades having passed since that night when an explosion and subsequent fire resulted in the deaths of 167 men on-board, Rev Craig has had to seriously consider how to best mark the event. He said: “It’s a complicated thing. Time affects people in different ways. We decided to make the 30th anniversary more low key than the 25th and that was as a direct result of some families approaching me after the 25th anniversary expressing gratitude that we’d done it, but that they now felt ready to ‘move on’, as it were. One of the biggest legacies of the Piper Alpha disaster has been a North Sea oil and gas industry which is more aware of the safety of workers. So prevalent is that consciousness that Rev Craig said he had never felt concern for his own welfare on an oil rig. He said: “Piper Alpha has basically brought about the safety regime that we have now. Processes have been changed to ensure it doesn’t happen again. I go offshore every couple of weeks and the first thing you hear is that safety is the number one priority. “Everyone is empowered to stop a job. Everyone is empowered to put a safety card on if something concerns them. All that openness to safety is very evident. The guys out there are complete professionals. Yet, as shift patterns on many rigs move to a more intensive three-weeks on, three-weeks off schedule, Rev Craig has voiced concerns over the potential health impact on workers. He said: “Changing shift patterns is definitely the topic I hear about most often offshore. A former Royal Air Force chaplain, Rev Craig is a sounding board for the fears of those working offshore, but also the families back home. He said it is important to demonstrate that you care “through actions as opposed to words”. That means maintaining the book of remembrance, where those who lost family and friends in the Piper Alpha disaster pay their respects, yet he’s also been working on other ways to involve people. Working with the North Sea safety organisation Step Change in Safety, the chaplaincy has arranged to stream the 30th anniversary remembrance service online so that North Sea workers can pay their respects. He said: “We’re going to be marking the occasion from Hazlehead live, so that people from the offshore community can pick it up and we can join together at the same time whether you’re onshore or offshore.